Wine glasses topple over. Dishes are slippery when wet. Beer bottles clink together. When glass breaks, many people will simply sweep up the shards and pour the contents into the recycling bin. Can You Place Broken Glass in the Recycling Bin? The answer is plain and simple — NO! This creates an extremely unsafe environment for anyone handling your recycling bin — whether that person is you or the employees of your recycling service. Yes, glass can break when it’s all placed in the truck, but the number one priority is the safety of the handlers of your recycling bin. Step 1: Lay a piece of cloth on the floor (the thicker, the better). Cloth is perfect because glass has a hard time cutting through this material. Step 2: Sweep up the shattered glass into a container, pour the contents of broken glass onto the thick piece of cloth, and then wrap the cloth so all of the glass is completely covered. Step 3: Grab a hammer and begin lightly hammering the pieces of glass until there are no big shards left. Step 4: Carefully pick up your wrapped cloth and place it in an empty box. Choose a box that won’t have a lot of excess space. If there is excess space, fill the remaining space with extra cloth or other materials. Step 5: Seal the box with a strong, adhesive tape. Step 6: On the box, write “Broken Glass.” This way the person collecting your trash will know the contents of the box. Step 7: Place the box in your garbage bin on collection day. 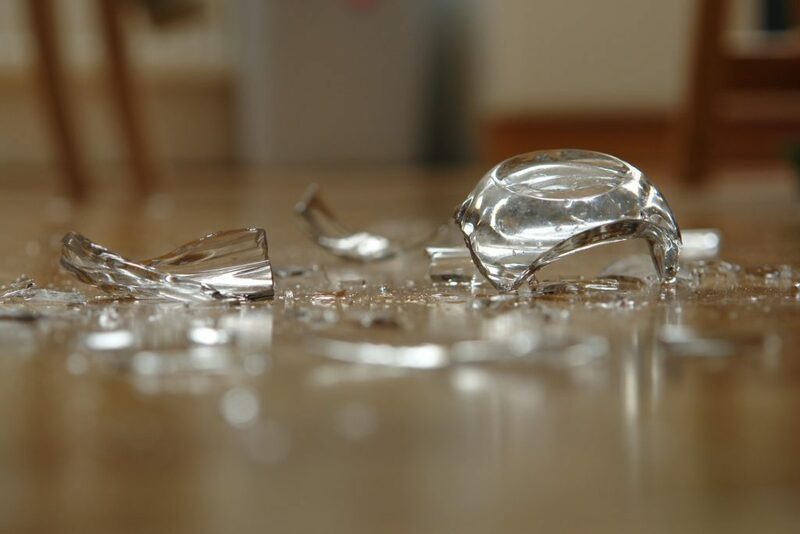 When glass breaks it can be extremely dangerous. This is why you need to dispose of it in the most cautious of ways. When you need the help of recycling professionals (for advice or for their services), we’d be happy to help! All you need to do is give us a call!